The equation ax2+2hxy+by2+2gx+2fy+c=0 denotes a hyperbola when abc+2fgh-af2-bg2-ch2≠0 and h2-ab>0. The hyperbola is the locus of a point in a plane such that the ratio of distance of that point from a fixed point, focus, to the ratio of the distance of that point from a fixed line, the directrix, is constant and is always greater than one. The points where the hyperbola meets the line joining the foci are called the vertices. The mid point of foci if called the Center. The line joining the vertices is called the Transverse Axis. 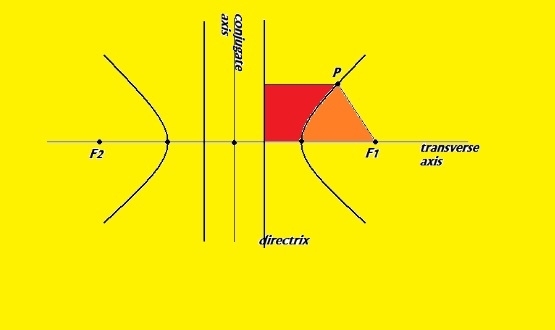 The straight line through the centre perpendicular to transverse axis is called the Conjugate Axis. A hyperbola can also be defined as the locus of a point which moves in a plane such that the difference of its distances from two fixed points(foci) is always constant. A line segment whose end points lie on the hyperbola. A chord passing through hyperbola. A chord perpendicular to the transverse axis. A double ordinate passing through focus. Many results of hyperbola can be obtained by just changing the sign of b2 term. However, one should practice deriving the results by hand to practice working with hyperbola. The tangent drawn at any point bisects the angle between the lines, joining the point to the foci, whereas the normal bisects the supplementary angle between the lines. The locus of the point of intersection of two perpendicular tangents to a hyperbola is a circle known as the director circle. Equation of the director circle is x2 + y2 = a2 – b2. From any point (x1, y1) in general two tangents can be drawn to hyperbola. The equation of the pair of tangents is SS1 = T2 where the equation of the chord of contact is T = 0 and the equation of the chord bisected at the point (x1, y1) is T = S1. Auxiliary circle: The circle which is described on the transverse axis of an ellipse as its diameter. Two diameters are conjugate diameters which bisects chords parallel to each other. Condition turns out to be mm1=b2/a2 The only pair of conjugate diameters that are perpendicular to each other and does not satisfy the above condition is the major and minor axis of ellipse. If two conjugate diameters are equal, then they are called equi-conjugate diameters. A line which touches the hyperbola at “infinity” is called asymptote. The combined equation of Asymptotes is (x/a+y/b)(x/a–y/b) = 0 or xx2/a2 – y2/b2 = 0 which shows that the equation of the asymptote differs from that of the hyperbola in the constant term only. Also the angle between the asymptotes is 2 tan–1 (b/a). The lines x2/a2+y2/b2=0 are also asymptotes to the conjugate hyperbola x2/a2–y2/b2=1. Any line drawn parallel to the asymptote of the hyperbola would meet the curve only at one point. The equation of the hyperbola and that of its pair of asymptotes differ by a constant. For example, if S = 0 is the equation of the hyperbola, then the combined equation of the asymptotes is given by S + K = 0. The constant K is obtained from the condition that the equation S + K = 0 represents a pair of lines. Finally the equation of the corresponding conjugate hyperbola is S + 2K = 0. Q: Find the equation of hyperbola whose focus is (1,2), directrix the line x+y+1, and eccentricity is 3/2. Q: Find the hyperbola whose conjugate axis is 5 and the distance between foci is 13. Q: Find the equation of hyperbola whose foci are (8,3) (0,3) and eccentricity is 4/3. Q: Find the hyperbola whose asymptotes are 2x – y = 3 and 3x + y – 7 = 0 and which passes through the point (1, 1). Q: Prove that the chords of the hyperbola which touch its conjugate hyperbola are bisected at the point of contact.